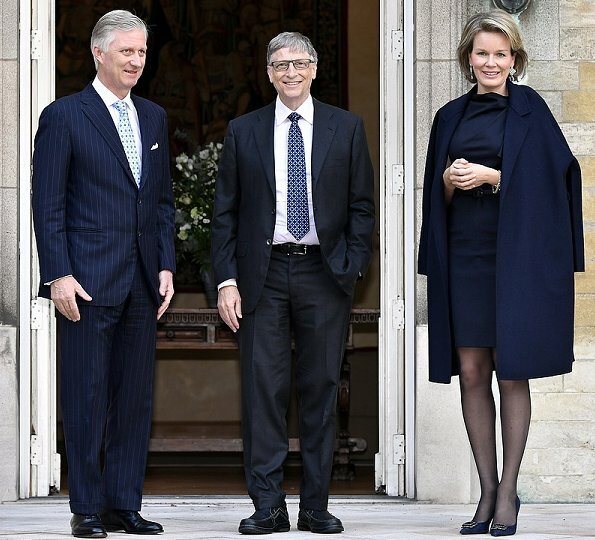 On February 16, 2017, King Philippe and Queen Mathilde of Belgium met with founder of the Bill & Melinda Gates Foundation Bill Gates and his wife Melinda Gates at the Royal Palace in Brussels, Belgium. 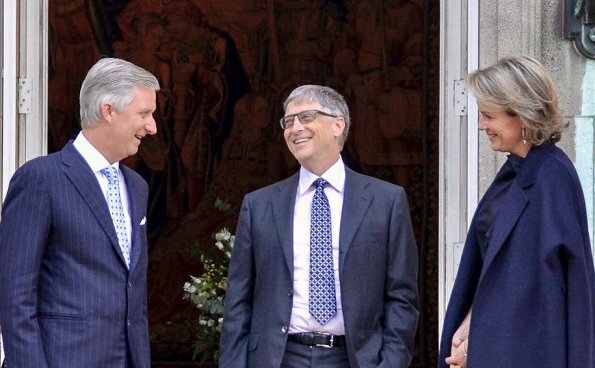 If anyone deserves honors, it's Bill and Melinda Gates. 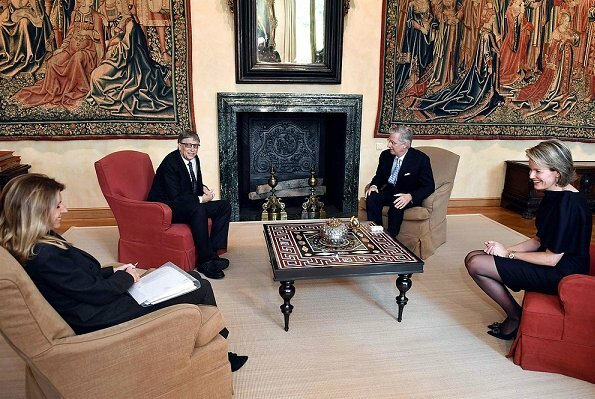 Everybody respects Bill Gates. Everybody LOVES Steve Jobs. Not more than everybody who is helping other people as a volunteer in his free time. On peut "aimer" Steve Jobs pour ses inventions mais l'homme avait une face cachée plus noire . That is absolutely true, Myriam. But IT-people still love him anyway. I really think he was some kind of genius. But I don't expect anybody to agree! Mathilde looks great this time. Blue in all its shades is the best colour for her. It is a great colour on her. Very understated and elegant. Bill Gates - probably one of the biggest criminals this world has ever seen. Why do you think so, Vanessa? I really would like to know! If you look at how media presents him, he looks like a saint. If you research him a bit, you´ll find controversy. If you dig deeper, you´ll find what I´m talking about. He likes to play God, and sadly, his enormous wealth allows him to do so. He´s the last person on the planet that deserves any honors, if you ask me. I cannot think of many people who singlehandedly have caused more damage to the world, than him. @vanessaS, your brand of logic is registered in a different layer of mentality than mine and also many other people. Mathilde looks absolutely elegant & chic! Perfect perfect perfect head to toe! Bill Gates is THE most wonderful person. They both are Bill and Melinda are amazing people doing so much for the world. PS. There are unfortunately people who will find , who wants to find no matter what all bad in all goodness. Please don´t call me unfortunate for having come to a different conclusion. I´d like to ask you to view the following documentary: https://www.youtube.com/watch?v=87qrTXZaXkk while keeping in mind that Bill Gates holds a major share of Monsanto´s stocks. It´s a long documentary, but it´s very well done and definitely worth your time. I´d very much like to hear your views on it. I find it troubling and highly concerning, but if I´m wrong in my conclusion, then I´d love to have someone point that out to me, and explain their reasoning to me. I´m willing to consider any well-founded point of views. Vanessa, I am intersted in that documentation and I will watch it! I really like Mathilde in navy! This is a look I wish Mathilde would repeat more often, it looks younger and fresher!